You might have heard some hustle and bustle around a new Instagram account "PreachersNSneakers". 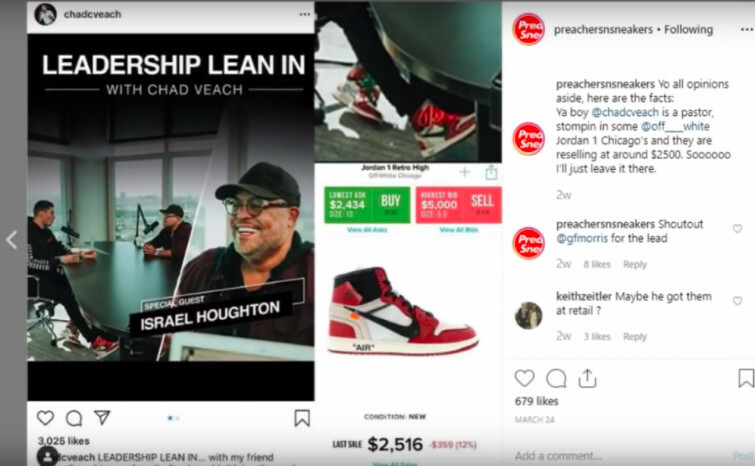 Churchleaders.com reports that the account started out as a joke and was created by an anonymous self-described evangelical Christian who also dabbles in buying and reselling sneakers, but it has now grown into heated discussions on pastors, finances, and stewardship. The creator, who Fashionista refers to by the pseudonym Tyler Jones, started the account a couple of weeks ago and is has grown so much in those short weeks. He came watching a worship song by Elevation Worship, and he noticed that the worship leader was wearing a pair of Yeezy 750s, which Jones says resell for around $800. Familiar with the average church-workers salary (Jones’ wife works at a church), he was shocked by what he was seeing. When he dug a little more he found out that the senior pastor: Steven Furtick also likes to wear "nice shoes". “All I do is find pictures, look up the things that they’re wearing and then put out the current market price and let you decide what you feel about that, you know?” Jones says. Jones uses a site called StockX which tracks what the market is willing to pay for a new pair of particular shoes.